Blue and white fabrics. A timeless palette duo that’s hard to beat. Whether your look is breezy or sophisticated, crisp navies, soft blues and whites are fresh, stylish and equate to what is essentially risk-free decorating! Beach or Lakeside? Farmhouse, Boho, Traditional or Transitional…blue and white won’t disappoint no matter no matter where you are. This family-friendly look is perfect for casual or informal living. Light to medium shades of blue are a great way to play up traditional collections of Delftware or Wedgewood. We adore these cottage and block print styles from Jennifer Adams Home and John Robshaw. An easy, blue and white no-brainer is a modern (or traditional) toile. 9th Century Chinese pottery was highly revered and is still super relevant today. Porcelain was invented by the Chinese, hence “China”; with it’s brilliant cobalt blue glazing – graceful and stately as ever. Talk about design with staying power! Doesn’t this bedroom look inviting? We all know of blue’s wonderful calming effect and and how tranquil – even a room full of blue, navy and white pattern – feels. 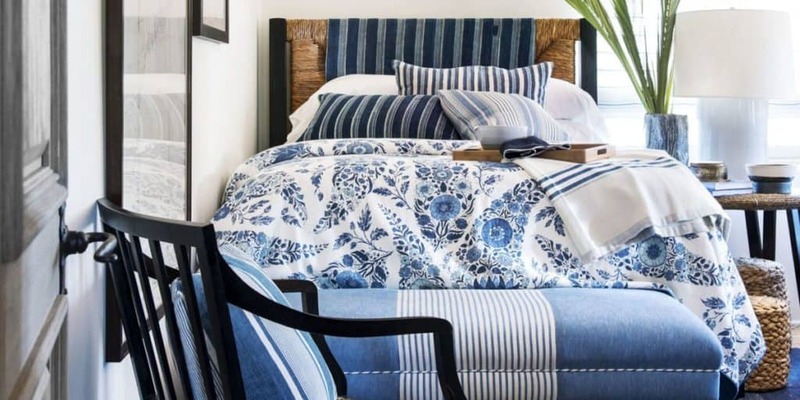 Cool blue and white fabrics pair beautifully with warm earth tones and texture like this room’s rush headboard, woven ottomans and smooth wooden frames. Cover Photo Chair Fabric: Find a similar look at 1502fabrics.com from Lacefield Designs.